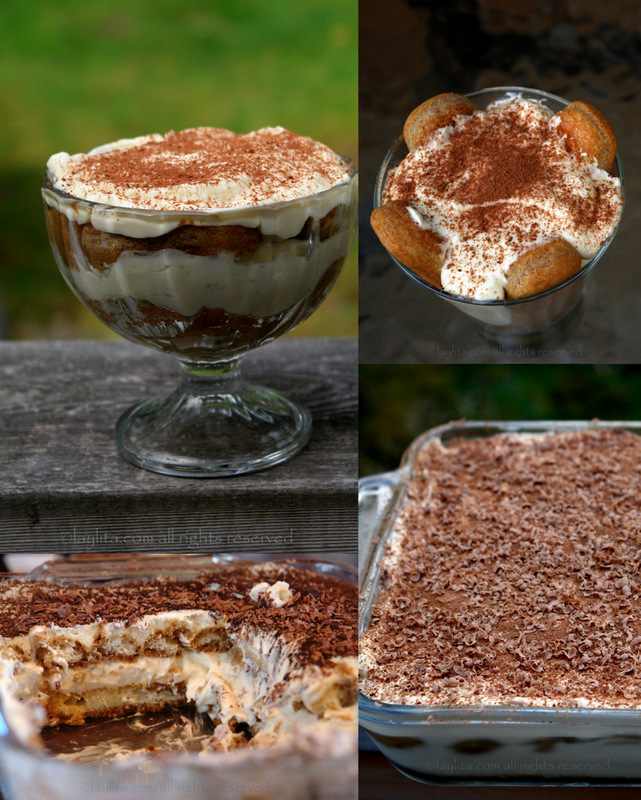 This easy homemade tiramisu recipe is made with mascarpone, ladyfingers, eggs, sugar, coffee, rum and cacao powder. Tiramisu is one of my favorite desserts. 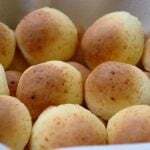 I remember clearly the first time I ever tried it at an Italian restaurant in Houston with my grandmother and my aunt, I thought it was one the most amazing things I had ever tasted. For a while I became obsessed with trying to find the perfect tiramisu. Ten years later I met Rossana, a super fun Italian lady with a great fashion sense – known for hiking in high heel leather boots and commenting that even her pajamas are more fashionable than what she sees in most mall clothing stores (I do shop at mall clothing stores so I am considered highly unfashionable). 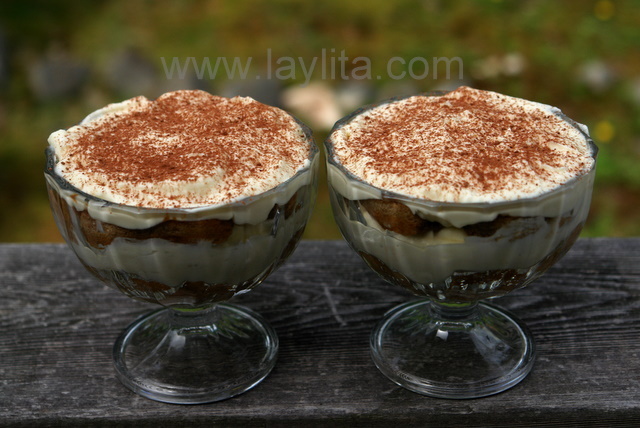 Rossana also cooks amazing food and has shared many of her delicious recipes with me, including her tiramisu recipe, it is the best tiramisu recipes that I have tried. 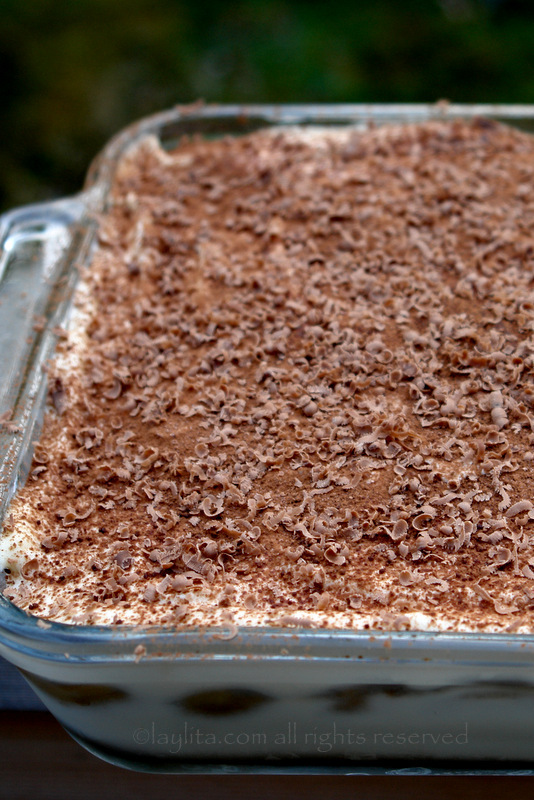 Easy homemade tiramisu recipe made with mascarpone, ladyfingers, eggs, sugar, coffee, rum and cacao powder. 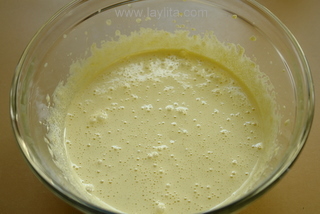 In a medium size bowl beat the egg yolks until foamy, add the sugar and the rum. 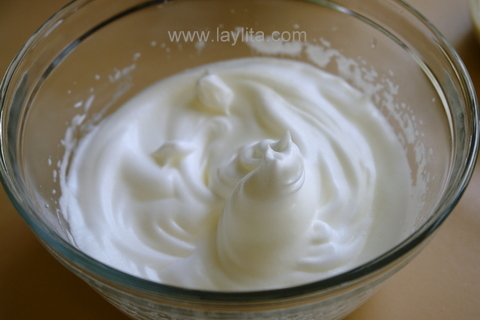 Use a spoon to add the mascarpone cheese to the egg whites, fold the mascarpone in gently. Gently stir in the egg yolk and sugar mix. Dip each ladyfinger into the coffee – it should be a fairly quick dip that moistens the cookie without getting it soggy. 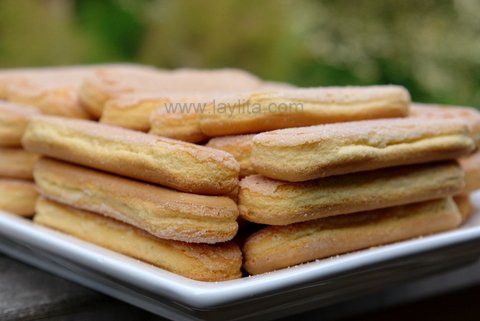 Place the coffee dipped ladyfingers in a square serving dish until you have a full layer of cookies. Cover the coffee dipped ladyfingers with the mascarpone mixture cream and top with another layer of coffee dipped ladyfingers. Refrigerate the tiramisu for at least 6 hours – overnight is ideal. Sprinkle the cacao powder on top and add the chocolate shavings before serving. 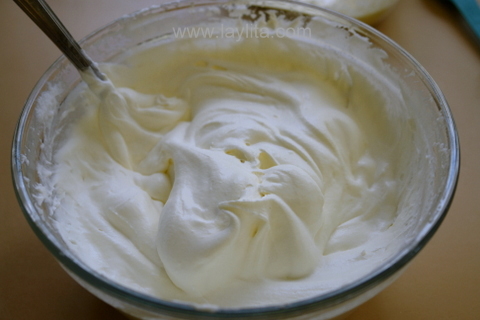 I made one small change to her original recipe: I added some rum to the mascarpone cream. 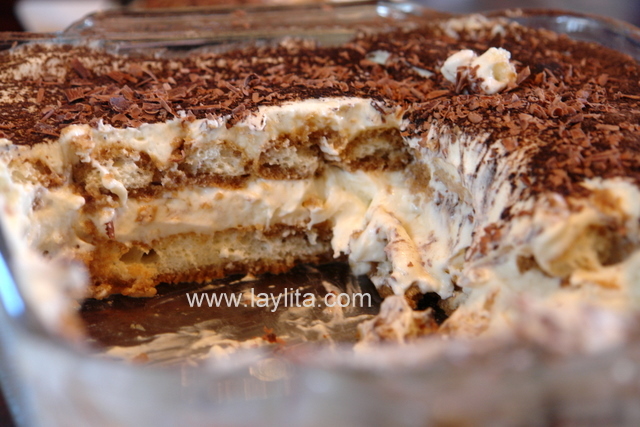 The big test was having Rossana taste the tiramisu the first time I made it using her recipe – she is very direct and will tell you to your face if it doesn’t measure to her standards. Even before tasting it, she was highly skeptical about it when I told her that I added a tiny bit of rum. Maybe it was beginner’s luck but she actually liked it and said it was a good as hers (huge compliment). The second time I made it for girls champagne party, and of course Rossana was there, this time she commented that the ladyfingers were slightly soggy and that she preferred it better last time. 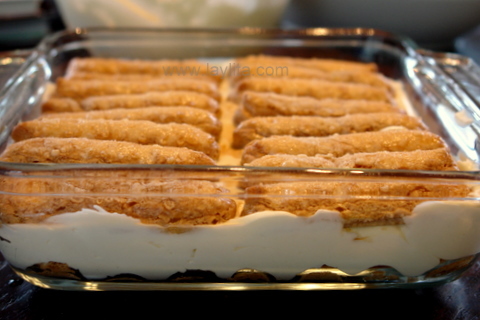 One of Rossana’s main complaints about tiramisu served in Italian restaurants (in the US) is that the ladyfingers are too soggy. 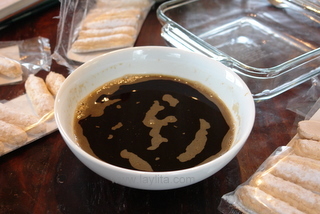 The process of dipping the ladyfingers in coffee needs to be very fast, about 1-2 seconds as they absorb the liquid quickly. Also, different brands of ladyfingers sometimes have different absorption rates, so I recommend doing a test with the first ladyfinger each time to get the timing right. On the other hand, the sogginess is essentially a preference; one of my friends at the champagne party preferred the tiramisu with the slightly soggy ladyfingers. 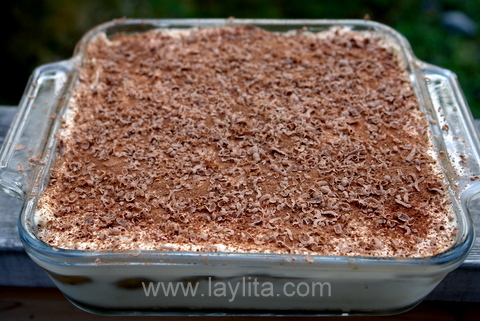 Most of the time I use a standard square glass serving dish for the tiramisu and the cut it into squares when serving. However you can also use individual glass cups or cocktail glasses. 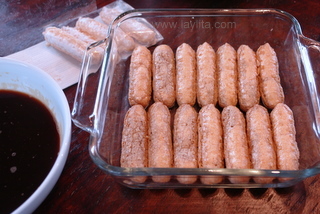 You will probably need to cut the ladyfingers into the right size based on the container that you are using. Laylita! Thank you for this amazing recipe. My very first shot at tiramisu and it turned out simply fantastic. 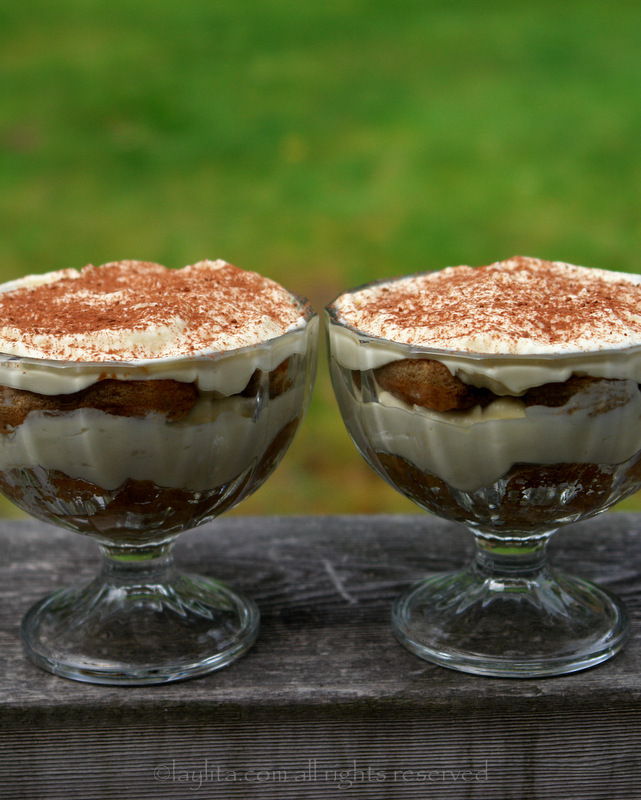 Hubby loves tiramisu and cannot believe i could pull something like this off. Thanks once again! Very good Tiramisu! 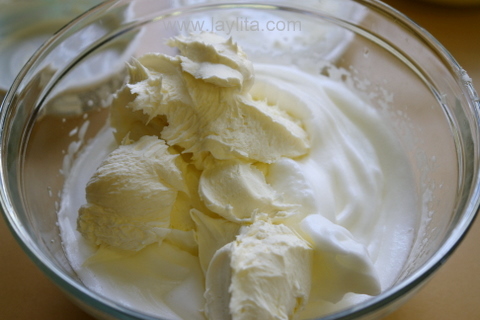 I use the same recipe but I add some Whiskey to the mascarpone cream instead of rum. It’s absolutely delicious, you should try it! Congrats for your blog, I love it! I was googling Tiramisu and I came across your recipes. The Tiramisu looks SOOO scrumptious! I can’t wait to try it! Thanks for sharing all your great recipes with everyone! I also just discovered you blog while I was searching for a poached pears recipe. I can’t stop salivating! Everything looks so amazingly delicious! I’m going to make all of my family’s meals next week from the recipes in your blog. Thank you for sharing your wonderful food knowledge! Just a great post! I love your pictures, they are truly first class! 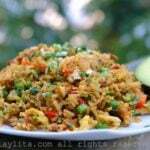 I just found your blog and i am so amazed with the food that you prepare! I am in love with your blog! At first glance of your photos I thought I could taste that tiramisu. Bravo. If you need help eating it, I would be willing to ‘take one for the team’ as they say. Thank goodness you’re back in action :) This looks amazing. I love your blog please post more recipes! Laylita me alegra ver de nuevo una de tus deliciosas recetas…. I am going to try this one for sure. By the way, your website is my favorite! I just came back from living in Peru, so a lot of your recipes remind me of the food from there. Really happy to see a post from you again! Welcome back, so glad to see you posting again. 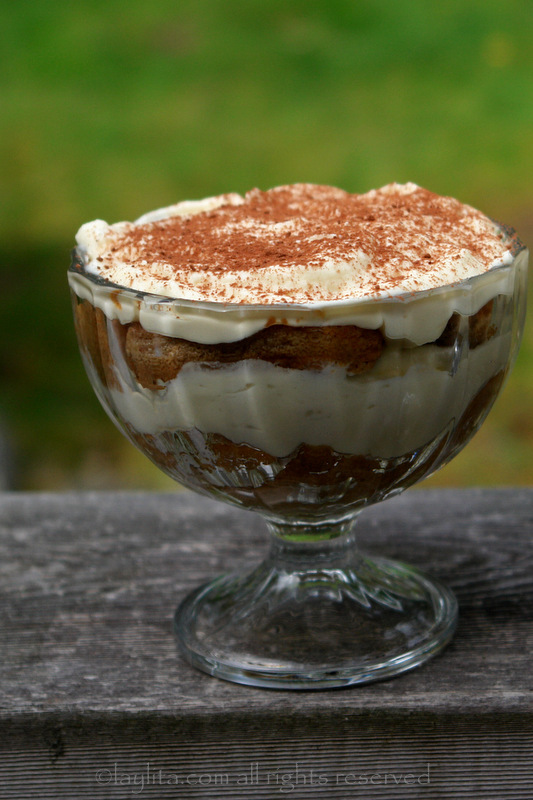 I love Tiramisu so I will try this for the holidays. My family loved your beef tamarind stew last year for our post Christmas holdiday meal. Thanks for the great recipes and pictures. I wish you and your family a happy Holiday season! Hmmm – this looks picture perfect and oh so delicious. This recipe looks so easy and yum, cant wait to try it!! Nice too see you’re adding new recipes, I love your blog! welcome back!!! finally!!! :) :) :) looking forward to some new ecuadorian food recipes! keep posting! :) thanks! I was wondering when I would hear again from you. 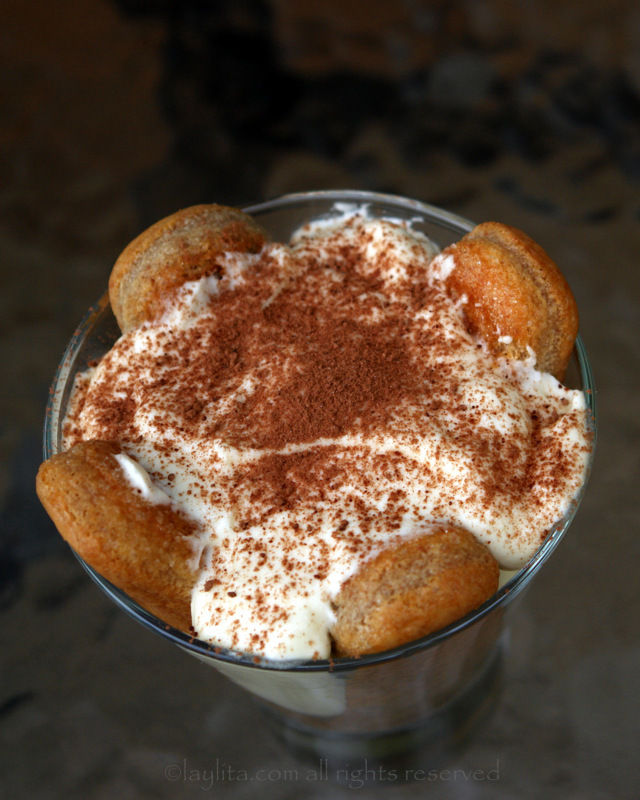 Glad you are back and looking forward to your posts…Elegant Tiramisu! I’m so glad you’re back I keep checking every afternoon and what a great surprise to see you posting again. 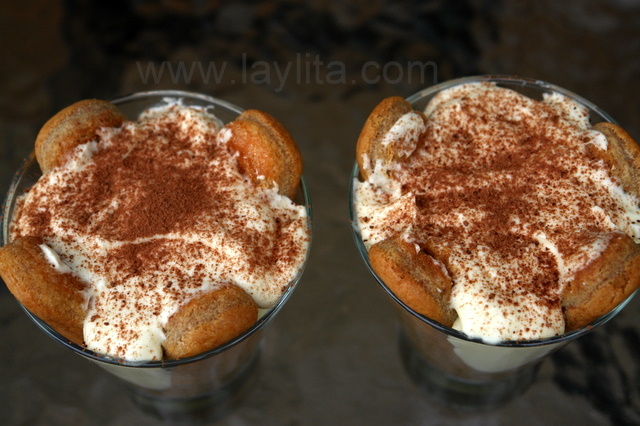 thank you for this great recipe I’ve been wanting to make Tiramisu, love your step by step recipe. Welcome back! Yay! You’re back! We’ve missed you! Also glad to see a new post. I am Cuban but my Ecuadorian husband’s family makes (soggy) Tiramisu all the time :(. I was wondering if this recipe would be Ecua or Italian, glad to see it’s authentic! 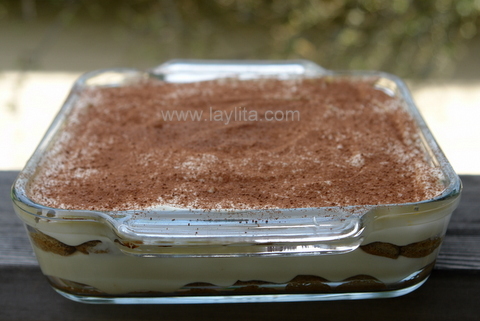 A beautiful Tiramisù! Happy to see you posting again. Laylita, I am so happy you are posting again. Your blog is the BEST one for Ecuadorian food. I am definitely trying this dessert. Please keep posting! Hi..glad to see you posting again. YUM!